I like my fish with skin and bone always, so no fillets for my home cooking though we get the Basa fillets very conveniently at a walking distance from our place. 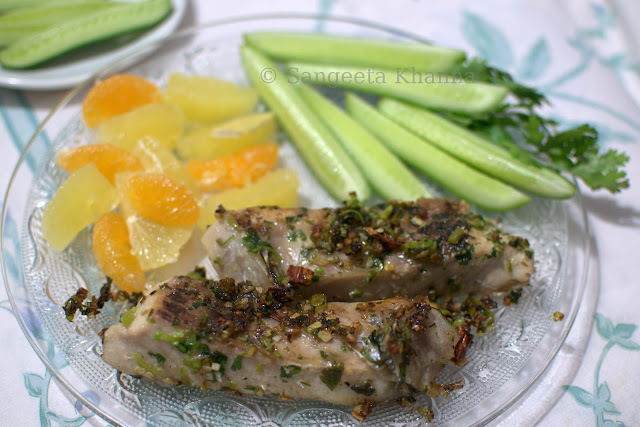 The Basa fillets I like only in Chinese style poached or steamed fish recipes, for more robust flavors it has to be a large Rohu or Bhetki cut into bony steaks. This time I wanted a nice aromatic herb flavor in a shallow fried fish, the large steaks of the tummy side were just perfect for it. I had collected a few Coriander roots and stems, very aromatic to complement it. It ended up bursting with flavors. You can use a fillet of any soft fish too for this. Rub the anardana powder and salt over fish steaks and refrigerate for about 6 hours or overnight. Do the other preps which takes just 5 minutes, chopping the green chilly, garlic, ginger and coriander greens that is, and mix everything together, the herb mix. The scissor cut red chilly will also be mixed into it. Sprnkle a pinch of salt to it too. 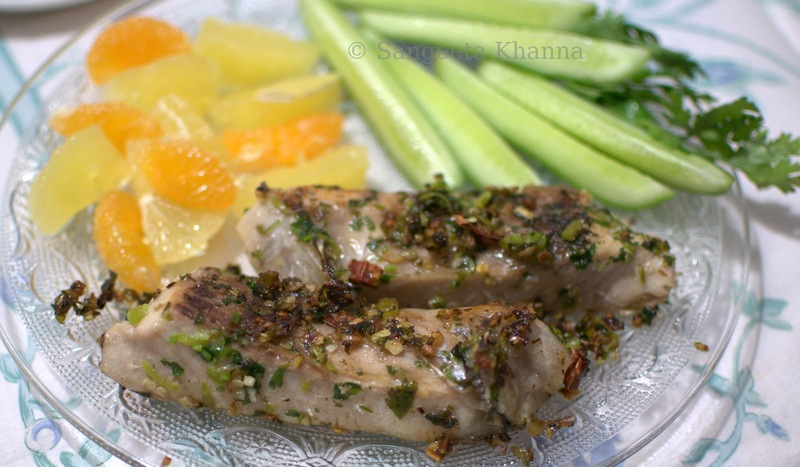 Heat oil in a flat base pan.sprinkle half of the herb mix and immediately place the fish steak over it. Cover the pan and cook for 2-3 minutes on medium flame. Cooking time would depend on how thick is the steak. Sprinkle the other half of the herb mix on top and flip the fish steak to brown and cook on the other side, covered for about 2-3 minutes again. meanwhile, cut and arrange the cucumber, orange, sweet lime and grapefruit (if available) segments on the plate. Some Rocket or lettuce will be added benefit. Serve the fish hot on this plate. The remaining herb mix on the pan not to be wasted, serve it along. You would pick every little bit off the plate. Very refreshing. The Coriander greens have the best aromas in the base parts, the thick stems and the root. Use them for any meats that absorb flavors. 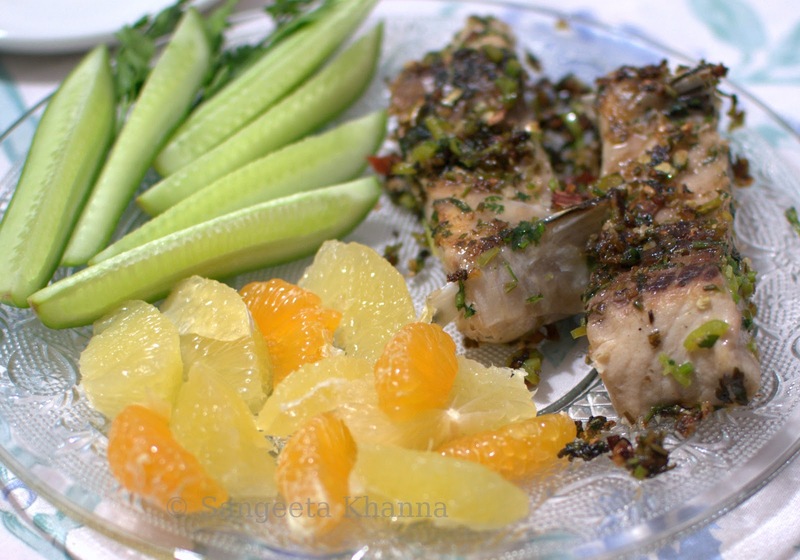 A herbed fish fry served with a citrus mix ..
brilliant : must try .. I am loving this healthy recipe. I am back to South beach diet and have been looking for recipes that will fit the rules. I make a lot of fish dishes and I can eat this one in phase 2. 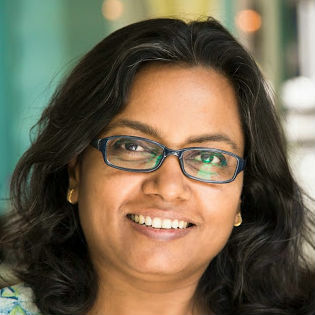 So glad that I stumbled upon your blog. See ya around. Thanks a lot for stopping by and leaving such wonderful comments. I liked your fish recipe here too...but I prefer fillet to actual bone-in fish, guess I'm too lazy to pick out the bones :) But my hus really loved bone-in fish. This I like very much. I am not too 'fishy' a person but aspire to get there one day. That rub really sings to me, and the ease of putting this together too. I have heard before that the roots and stems of coriander have a robust flavour. Now need to remember it well! I like the citrus salad on the side too! Very yummy!! I try frying the fish with such herbs but end up burning them! while the fish skin still remains way too tender..
Cook covered. That way it gets fried in minimal oil and doesn't burn the herbs and garlic.